As always, our regular articles “where to eat”. This time it is some places near the Music Hall of Williamsburg. On 17th of May, the concert of Andy Shauf is held there. 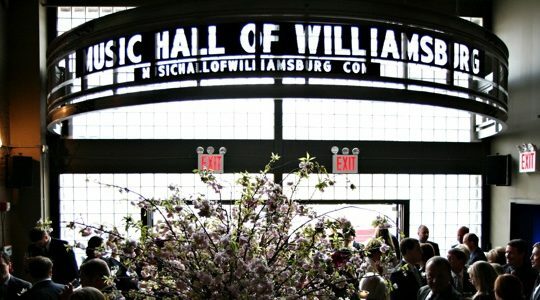 Check out also places where you can stay near the Music Hall of Williamsburg. So, let’s read! Zenkichi is a modern Japanese brasserie with an authentic dining experience of popular Tokyo establishments.Take a break from festive see-and-be-seen scenes and hide away in the intimate semi-private booth tables. This relaxing setting enables you to concentrate on Japanese food, sake, and your dining companions. Once seated, you can savor Japanese seasonal small plates meant to be shared with the table. Complete your meal with the best selection of premium sake. You will taste the difference! Zenkichi invites you to explore Japanese cuisine beyond sushi and yakitori. Their specialty is Tokyo-style seasonal small plates, for sharing and pairing with sake. Savor the dishes popular among Tokyoites, and enjoy the harmony of subtle & bold flavors. Founded in 1983 in the East Village, Cafe Mogador was both an early pioneer in the NYC restaurant world and a downtown cultural hub. Serving up her signature Moroccan-inspired cuisine, founder Rivka embraced and celebrated the creative neighborhood she called home while pushing culinary boundaries. Over the next three decades and throughout the addition of a second location in Williamsburg, Cafe Mogador would gain tremendous recognition and solidify its place as a neighborhood institution and culinary destination.The same founding family still owns and operates both locations today. At the core of the menu are Moroccan-Israeli traditions, yet French, Indian and New American flavors also reflect the heritage of the people who have helped create the menu over the years. Sourcing organic ingredients wherever possible, the restaurant prides itself on quality and consistency. The curved wooden bar offers a wine list boasting some of the best value and vintages in the city and a versatile list of seasonal hand-made cocktails. Friendly staff welcome guests like family, and over thirty years of history permeate the candle lit space. Throughout the years Joe’s Pizza in Greenwich Village has become just as popular with visitors and tourists as it is with native New Yorkers who know where to come for an authentic New York street slice. Adorned with antique Parisian fixtures, furnishings and collectables, the atmosphere evokes feelings of nostalgia from a picturesque era.The main dining room offers romantic nooks, lively bistro seating and extravagant greenery. The open-air rooftop terrace, elevated above the bustle of the streets, preserves the quaint seclusion of an intimate café. Located in the heart of Williamsburg, they provide a memorable setting within a neighborhood that continues to redefine itself.